In the next game from the studio behind the episodic adventure games Sam & Max, Strongbad, and the Tales of Monkey Island, the fictional town of Scoggins, Minnesota is a cold play and also a bit weird. "It's a dark comedy," the game's lead designer, Mark Darin, told Kotaku in a phone interview today. "It's a black comedy. There are definitely some moments that will make you giggle and definitely some moments that will make you tear your hair out." 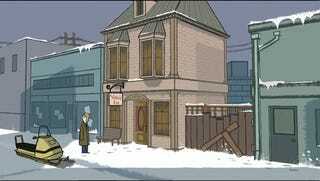 The setting is a new Telltale-made town in the Grickle world, the cartoon land of oddities created by the celebrated comic artist Graham Annable. The cartoonist, who used to be a creative director at Telltale, is doing visual design and artwork for the game. This premier Nelson Tethers adventure is set in the kind of place familiar to fans of Twin Peaks or Fargo, Darin said. There's a mystery Tethers is investigating: Why the Eraser factory in Scoggins, Minnesota got shut down. As Darins explained, the townsfolk are harboring their secrets. They're hiding something. The game will play differently than many of Telltale's recent adventures. Players will still explore carefully drawn scenes, talking to the characters that populate them, but the puzzles they solve will be brain teasers. While the Tethers gameplay style may seem close to that of the Nintendo and Level 5 Layton games, Darin believes that a distinguishing factor will be the integration of the puzzles into the fiction. "We're really trying to hard to make sure all the puzzles you encounter in the world feel connected," he said. "Sometimes Professor Layton has a disconnect between the puzzles and the world. We're trying to close that gap as much as possible." Nelson Tethers is set for release on the iPhone, iPad, PC, Mac and WiiWare, launching on one or more of those platforms in June. The game is part of what Telltale is calling its new "pilot program." Instead of being developed as a series, it will launch just as the pilot. Should it be well-received a season will follow, one episode per month.